Fully customizable toolbar. 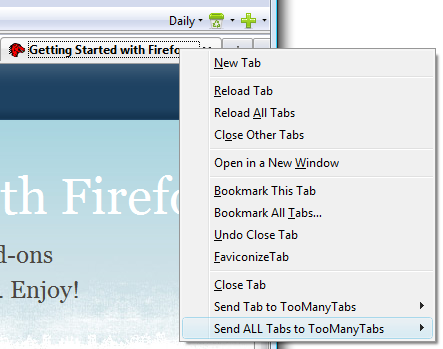 Simply drag and drop to rearrange the buttons on TooManyTabs. More details at this post. List all tabs in row button. Just like the FF button that lists all tabs opened. This button lists all the tabs stored in the selected row. New icons: We have updated our icons with some free icons . We hope you like them. Enable shortcut to options in row menu. Now you can decide where to put the shortcut in the the menu. For those who have a long row lists may prefer to put the shortcut at the top rather than at the bottom. Full screen mode now correctly shows TMT when it is at the bottom. 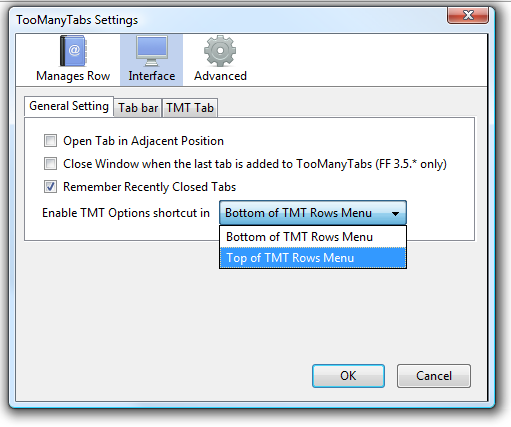 TMT also autohides with url bar together when it is at the top position. Now compatible with Chromifox Extreme 3 theme. This is a graet addin - but I don't understand - where is version 1.0. All links go to 0.44. Hello, TMT 1.0.0 is still in the experimental section. It is available for download here.